In spite of modern advances in central heating systems, fireplaces continue to stand out as highly attractive features in the housing market. For many, the idea of gathering around a gently flickering flame in the company of loved ones evokes profound feelings of warmth, intimacy, and security. Others simply prefer the nostalgia of smoldering coals or bundles of wood and kindling to the cold industrial look of more efficient heating systems. Homebuyers of all ages and economic backgrounds rank fireplaces high on their list of “must have” home features. However, consumers of different generations often have individual ideas of which specific type of fireplace best suits their needs. Although popular in today’s housing market, fireplaces can be traced back to the earliest centuries. Archaeological findings indicate those cave men constructed contained fire pits within their living spaces. Survival depended on these pits, as they provided heat for cooking and warmth in cold climates. Over the course of thousands of years, the concept of in-home fires evolved into basic stone fireplaces. However, these structures lacked proper ventilation and resulted in homes being filled with toxic fumes and smoke. During the middle ages, people began exploring ways to more effectively contain fires and divert emissions. Smoke canopies inhibited the spread of smoke within rooms by venting it through roofs or walls. The invention of chimneys in the 11th or 12th century greatly improved fireplace design by providing a more reliable method of smoke ventilation and the ability to give them drafts. By the end of the 18th century, fireplaces had been refined into more efficient sources of heat with the development of the convection chamber and a taller, shallower firebox. These improvements laid the foundation for the wood-burning fireplaces of today. Though the necessity of fireplaces has changed, countless homeowners continue to enjoy the beauty and charm of wood-burning fireplaces. Increasing concerns of the detrimental impact on the environment have prompted manufacturers to engineer prefabricated energy efficient wood burning fireplaces. These models range from $2,000 to $3,000. In contrast, more traditional brick fireplaces with chimneys cost $15,000 or more to install. 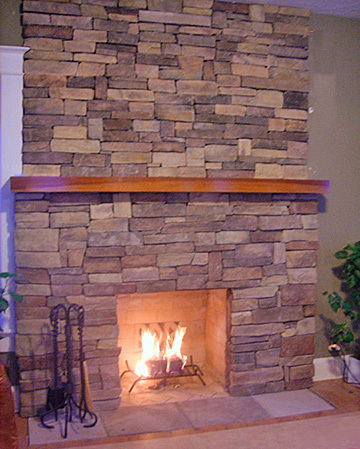 Wood burning masonry fireplaces tend to be the priciest yet most aesthetically pleasing installation option. A brick or stone firebox allows the fireplace to efficiently radiate heat throughout a room, while a chimney minimizes fumes and vents smoke. A wooden mantle adds visual interest to the structure. Construction of wood-burning fireplaces may require permits, so homeowners will need to carefully research local building code prior to investing in the construction of this particular type of fireplace. 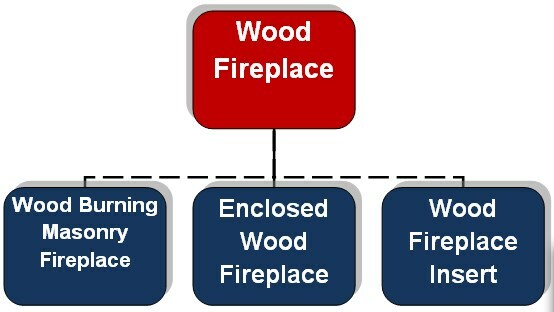 Though not as efficient as other fireplace options, wood burning fireplaces attract more consumers because of the relatively low cost of fueling them. Regular users spend an estimated $922 annually on firewood and kindling. This cost can be even lower for those willing to cut their own wood. Wood burning fireplaces also have a fairly small carbon footprint provided homeowners use sustainably harvested wood. Nonetheless, older and improperly maintained fireplaces and poor quality wood will emit harmful particulate matter. Fortunately, regular maintenance and responsible wood burning mitigate this effect. 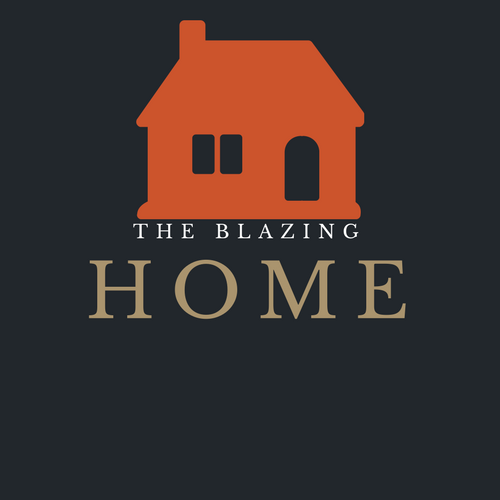 According to Baby Mom, Homeowners desiring more efficient wood burning fireplaces may decide to install an enclosed fireplace over a traditional open-hearth fireplace. While open hearth fireplaces create a more authentic ambiance within a room, they do not radiate heat as effectively as enclosed fireplaces. Enclosed fireplaces have a glass panel that allows occupants the luxury of enjoying the beauty of a soft burning fire with less heat escaping through the chimney. This results in a more concentrated flow of heat. Admittedly, glass panels lessen the charm of a fireplace by blocking out the wonderful aroma of burning wood and muffling the sound of its crackling. In an effort to avoid paying tens of thousands of dollars in demolition and construction costs, many property owners purchase wood fireplace inserts capable of transforming outdated and inefficient open hearth fireplaces into more modern and efficient fixtures. Installers simply slide the insert into the opening of an existing fireplace. Fireplace inserts typically consist of cast iron or steel. Similar to enclosed fireplaces, inserts use glass to optimize heat efficiency without compromising the visual effects of the fire. Heavy insulation combined with fans that direct heat generated in the firebox greatly improves the heating capability of fireplace inserts. Unfortunately, fireplace inserts have limited heating range, as they only emit heat from the front. Those hoping to use a fireplace insert to heat an entire house will want to consider other options. The installation of a fireplace insert runs around $3,000 to $4,000. The poor efficiency and hazardous emissions of wood burning fireplaces drove the search for better alternatives. The first gas fireplace emerged around 1895. It used heated cast iron to direct heat into rooms. 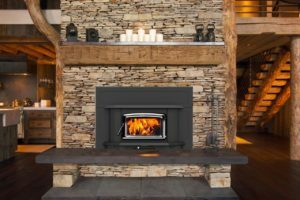 According to the owner of kayakingfisherman.com, The cost of installing a new gas fireplace ranges from a few hundred dollars to $20,000. Although less authentic than wood fires, modern gas fireplaces are designed with special effects that add realism to ordinarily lifeless blue flames commonly associated with gas fires. 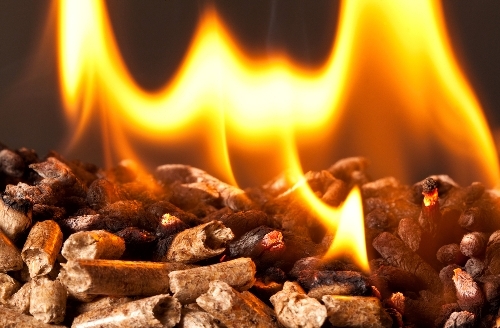 Homeowners even have the option of installing ceramic-fiber logs. Although anyone skilled in carpentry and drywall can install a gas fireplace in a matter of days, it is advised that homeowners hire a National Fireplace-certified technician to ensure the safest installation. The price of operating gas fireplaces varies by region. The high efficiency of gas fireplaces positively contributes to the environment by reducing the amount of energy necessary to warm a home. 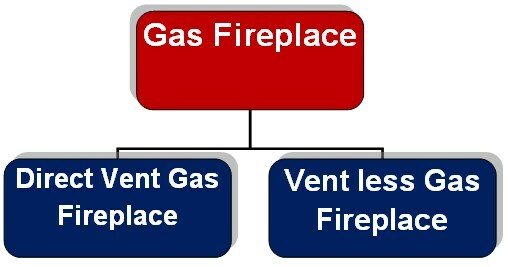 Direct vent gas fireplaces require chimneys or piping to pull outside air into a chamber for combustion. They do not need a flue since they generally produce cooler combustion gases. This eliminates the risk of back drafting. Direct vent fireplaces generate approximately 70% usable heat. Glass panels seal in the heat which lessens the amount released through ventilation. The ability to vent these fireplaces through walls and roofs makes them extremely versatile. In contrast to ventless gas fireplaces, vented gas fireplaces have a more authentic flame coloring. However, their flames tend to be smaller in comparison to other fireplace configurations. The cost of installing a direct vent gas fireplace is around $4,500. The simplistic installation of ventless gas fireplaces makes them ideal for homeowners looking to reduce the cost of labor. Automatic ignition allows homeowners to start fires without electricity which means they can be used during power outages. They do not require a chimney, as no smoke is released in the heating process. This has the potential to be problematic, however, since carbon dioxide, carbon monoxide, and sulfur dioxide can be released into the home. Consumers also complain that ventless fireplaces radiate a less appealing blue flame that detracts from the charm of having a fireplace. 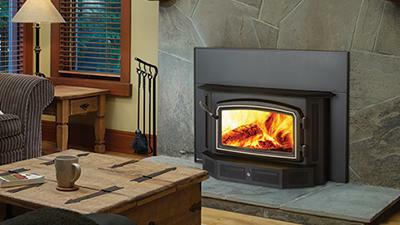 Ventless gas fireplaces rank high in affordability. The average cost of installation is roughly $1,200. Inspired by ancient lanterns, bioethanol fireplaces hit the market in 2005 as a viable alternative to less environmentally friendly fireplaces that release unhealthy particles into the air. These stainless steel fixtures consist of a burner tray, cover, and protective screen. 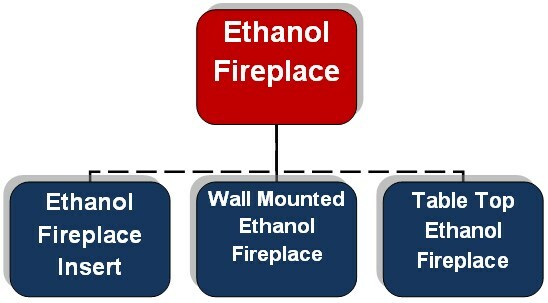 Similar to ventless gas fireplaces, ethanol fireplaces do not require chimneys or flues since the only by-products of ethanol combustion are heat, carbon dioxide, and steam. The ease of installation drastically reduces upfront costs. Homeowners can easily install most ethanol fireplace models in a matter of hours. Ethanol fireplaces use renewable energy derived from grains. Ethanol fuel is roughly $20 per gallon. 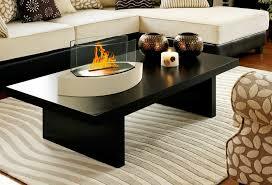 At the highest burner setting, ethanol fireplaces will burn for approximately 7 hours on 1.25 gallon of ethanol. Though cleaner and less detrimental to the environment, ethanol fireplaces should not be used as primary sources of heat because they are highly inefficient and require frequent refueling. Ethanol fireplace inserts are made with two layers of stainless steel insulated with stone wool to reduce the amount of heat transferred to the outer layer. This allows them to be safely recessed into walls, cabinets, or other types of surrounds. These configurations use liquid ethanol fuel that burns without releasing overwhelming odors. 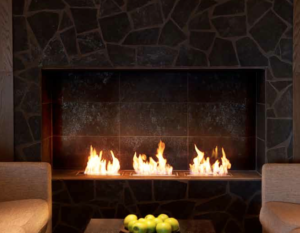 Unlike traditional wood burning fireplaces, ethanol fireplace inserts do not produce messy ash, soot, or embers. They require very little maintenance. The absence of vents makes them extremely versatile, giving homeowners the flexibility to install them in living rooms, bedrooms, kitchens, or outdoor spaces. 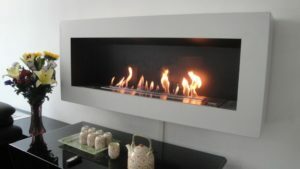 Ethanol fireplace inserts also conform to the modern design trend of simplistic elegance. Although these fireplaces do not emit smoke, users must exercise caution when operating ethanol fireplaces. Without adequate circulation, they will release carbon dioxide and carbon monoxide which can be dangerous in certain high concentrations. The cost of installation ranges from $3,500 to $10,000. Comparable to ethanol fireplace inserts, wall mounted ethanol fireplaces consist of fire safe construction materials that allow them to be mounted on walls with minimal risk of incident. They have the same versatility as ethanol fireplace inserts, as they are ventless. Installation can be completed in a matter of hours and does not require the labor of skilled professionals in most cases. The main difference between wall mounted ethanol fireplaces and ethanol fireplace inserts is that wall mounted units are not recessed into walls. While they lack the charm of more traditional fireplaces, their sleek design gives them a contemporary look that is in high demand. A unique application of ethanol fireplace technology is the table top ethanol fireplace. This design option modernizes the concept of a candlelight dinner by replacing them with miniature fireplaces. These freestanding fixtures have a wide range of customization options and add artistic flair to modern spaces. They require no installation or ventilation, and they use the same clean, renewable energy as ethanol fireplace inserts and wall mounts. This allows users to enjoy an open flame without the hassle of smoke, particulates, wax, and odors. Their environmental impact is minimal. Unfortunately, these units are strictly for decoration. They are not intended for use as primary heat sources in a home. The price of tabletop ethanol fireplaces ranges from less than $100 to the lower end of $1000, making them a highly affordable option for many. Interestingly, electric fireplaces originated in theater as a means of lighting up stage productions without starting uncontrolled fires. Since the most American homes still lacked electricity in the 1920s, electric fireplaces would not become popular in the home goods industry until the 1950s. Today, electric fireplaces stand out as a highly affordable option for homeowners desiring the feeling of owning a fireplace without the exorbitant construction costs. The initial cost of best electric fireplaces ranges from $200 to $2000. LED technology mimics the appearance of real flames without the use of wood or gas for combustion. 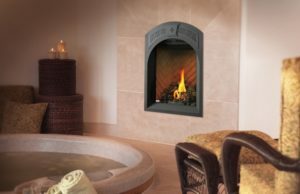 Similar to ventless gas fireplaces and ethanol fireplaces, electric fireplaces do not have chimneys or flues which allows them to be easily installed and moved without the use of skilled labor. The absence of a chimney allows consumers to heat specific zones within a space without loss of heat. 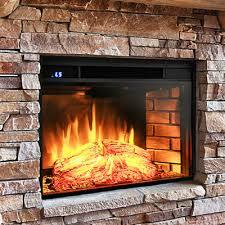 The annual cost of running electric fireplaces amounts to approximately $25. They actually have a positive environmental impact, as they release smaller amounts of carbon dioxide and are not fueled by wood. Zone heating allows homeowners to rely less on central heating. Thermostats can be adjusted to an energy saving setting without compromising comfort. Recommended To Read: Are Electric Fireplace Safe To Use? Wall mount electric fireplaces resemble modern televisions with their sleek space saving design. Not only do they serve as effective zone heaters, they also add visual appeal to space. Wall mount electric fireplaces use metal coils to conduct heat along with fans that divert the heat to a room. A light bulb and refracted light produce an imitation of flames. 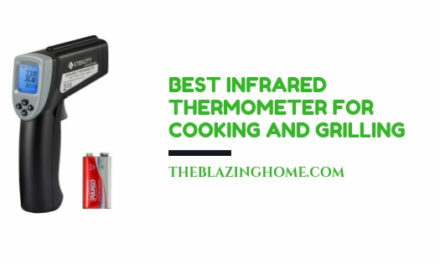 These models are highly efficient and capable of radiating heat with no loss. Units can be safely mounted since the heat generated by the coils does not transfer to the outermost surface. A major flaw of wall mount electric fireplaces lies in their inability to perform as a primary heat source in a home. They are, however, affordably priced with options ranging from $200 to $800. Unlike most electric fireplaces, electric fireplace inserts are not standalone units. Instead, they are designed to slide into existing fireplaces. Electric fireplace inserts allow users to upgrade less efficient configurations without taking on the high cost of renovations. They have the same portability as other types of electric fireplaces because they do not need chimneys or flues to vent emissions. 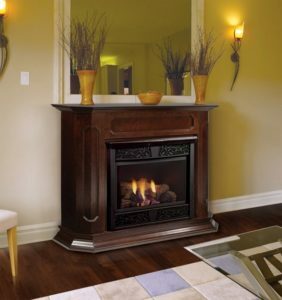 Unfortunately, electric fireplace inserts lack the authenticity of traditional fireplaces. They are often described as fake looking. Nonetheless, they are also very affordable with prices ranging from $100 to over $1000. Electric fireplaces with TV stands combine fireplace technology with media furniture. This functions very well in small spaces. These units do not require skilled professionals to assemble because they do not rely on chimneys or flues for ventilation. Electric fireplaces with tv stands provide zone heating that allows homeowners to turn down the thermostats of their central heating units during cold seasons without sacrificing comfort. This eliminates energy waste. However, consumers often complain that these units come up short in aesthetics when compared to traditional fireplaces. What they lack in authenticity, they make up for in affordability. 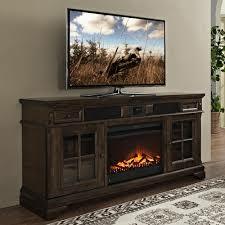 The price of electric fireplaces with tv stands range from $400 to over $2,000. 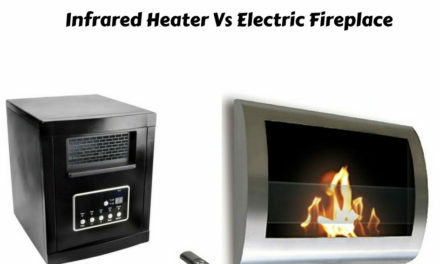 Also Read: Electric Fireplace Vs Infrared Heater: This Is The Best for Winter?? The most suitable fireplace configurations depend on the individual needs of consumers. The beauty of today’s market is that practically anyone can enjoy the luxury of sitting around a fireplace. For those with generous budgets, traditional wood-burning fireplaces offer superior aesthetics and a more authentic ambiance. However, they require more maintenance and cleaning than other options. Consumers of more modest means can opt for electric fireplace s that has minimal effects on the environment. Although a mere simulation of flames, electric fireplaces allow users a measure of flexibility in deciding where they want to install them. Gas fireplaces are fairly versatile and user-friendly but sometimes stifle the auditory and aromatic pleasures characteristic of wood fires. The best advice for those in the market for a fireplace is to thoroughly research each option and consult with professionals. I do like it when you mentioned that although gas fireplaces can be a bit expensive, it is to be noted that they are highly efficient and will warm up the home using the least amount of energy. If so, then I will suggest this to my parents as they are planning to get a new fireplace installed in the house son. I know that energy efficiency and eco-friendliness are their priorities, so this option will surely excite them. Thanks! It was really nice to know that there are different types of fireplaces available, but what got my attention was the gas fireplace as it is the one that burns more cleanly and gives more heat for a lower cost. I will surely suggest this to my parents for when they begin looking for a fireplace for the house. Since saving money is the one thing that matters to them, I believe this type of fireplace will be their best friend. Thanks! 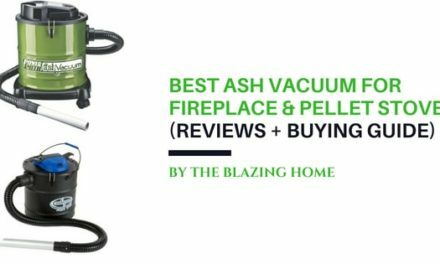 It sure got me when you mentioned the different types of fireplaces, but what I liked was the electric fireplace because of the idea that it is the most cost-effective and easiest to install. If we decide to go for that one then it will be convenient for us since we do not know the basics of fireplace installation. Of course, my dad will have to decide which kind of fireplace to go for, but I want to make a suggestion. Thank you.